The holidays are coming up, and with holidays come family. Family members that you might not have seen or spoken to since the last holiday party at Auntie’s house last year. I’m fortunate enough to have parents who still cook Thanksgiving dinner on their own, without asking me to peel yams or pull gizzards out of turkeys. But one thing that I have learned about cooking holiday dinners is that they are a production. The more family members there are, the bigger the production. If you plan on having a holiday or dinner party with lots of people, then I recommend that you get yourself one, two, or more of the new Sterno Buffet Kits. Available in two different sizes – full-size or half-size – these buffet kits have everything that you need to keep mass quantities of food warm. Both sizes come with a wire folding rack, a water pan, one or two food pans (depending on size) and Sterno gel fuel. The full size Sterno Buffet Kit also includes plastic serving utensils. Assembly was very easy – the wire rack just needed the two sides folded up, then placing the top piece on all four legs. Then set in the water pan, put water into the water pan, put in the food pans, light and put in the Sterno fuel, and voila! Food warmer. 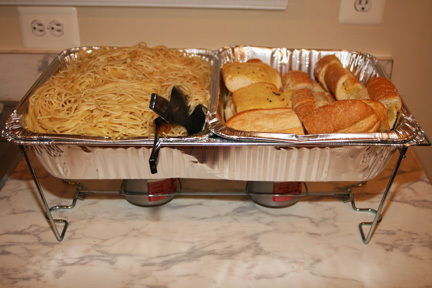 This past weekend, I put the full-size Sterno Buffet kit to the test by having an Italian Pasta party. And by that, I mean 3 boxes of spaghetti and three loaves of garlic bread. I think this was a good test of the Buffet Kit because it tested two different “food densities.” The spaghetti is very dense, with not a lot of room for air to move around. 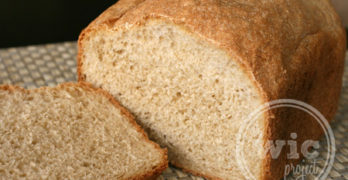 The garlic bread is very airy, with lots of space between the slices of bread. 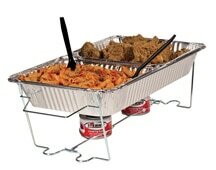 Would the Sterno Buffet Kit keep both foods warm? In addition, the Sterno Buffet Kit had to keep the food warm for an additional 20 minutes before serving while we cooked up the meat for the pasta sauce. The final test came about 30 minutes after the food first went into the food pans of the buffet kit, when we finally lined up to grab our dinner. Before serving, I tried to stir the spaghetti a little bit, but it was to difficult, so I served from the bottom, where I intuitively thought it would be warmer. I’m not sure that was even necessary because for the garlic bread, both the top and bottom pieces were hot. The verdict? SUCCESS. All nine of us declared our food to be perfectly hot. There wasn’t a single trip to a stove or microwave to reheat anything. The next time you’re having guests and have to cook-up and serve lots of food, getting the Sterno Buffet Kit will keep your food warm and will let your microwave enjoy the holidays along with your family. One more great thing! These kits can be re-used. They’re the kits that keep on heating. After you’re done with this year’s dinner, close the fuel cans, wash the pans, disassemble the rack, and store for your next big party! If you would like a Sterno Buffet Kit of your very own, you can find them at Wal-Mart and regional retailers across the country. You can also win a Sterno Buffet Kit in the WCatDD Sterno Buffet Kit Giveaway! Two lucky winners will receive a Full-Size Sterno Buffet Kit! Disclaimer: No compensation was given for this review/giveaway. I did receive a full-size Sterno Buffet Kit for the purpose of writing this review. This did not influence my opinions. 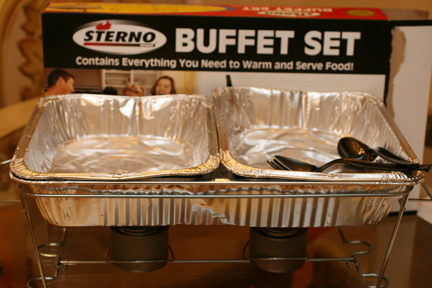 I would use a Sterno Buffet Kit at a family gathering or a bible study.Thanks for Sharing! I would use a Sterno Buffet Kit at a family gathering or a bible study. I was pretty impressed with how warm the Sterno Buffet Kit kept the pasta. I'm used to pasta that inadvertently becomes aldente because its not kept warm. However, this Sterno Buffet Kit did a great job of keeping a 9-serving heaping mound of pasta thoroughly hot! Every Thanksgiving my family rents a hall and we have a big buffet for all of our family members.Thats where I would use it at. I would use it for Thanksgiving at my house! I would use this for all my Holiday dinners. Our families has around 4 a year so this would be great. At a football tailgating party. I would use it at an upcoming anniversary party! I live out in the country and we have dinner parties when we invite the community ( about 20-25 people) atleast once or twice a month so Iw ould use it at home. I would love to win this to use for my granddaughter's 16th Birthday coming up!! We would use it out on the deck for our next party. It's still outdoor weather here. 🙂 Thanks!